Mon., June 25, 2018, 5:55 a.m.
Around the Northwest League and the Texas Rangers affiliates for Sunday’s games. Spokane 4, Vancouver 3: Hasuan Viera went 3 for 4 with a key two-run double and the Indians (3-7) beat the visiting Canadians (3-7). Boise 5, Eugene 1: Frederis Parra (1-0) struck out six over six shutout innings and the visiting Hawks (5-5) beat the Emeralds (5-5). Cade Harris went 2 for 5 with a solo homer in the fifth inning. 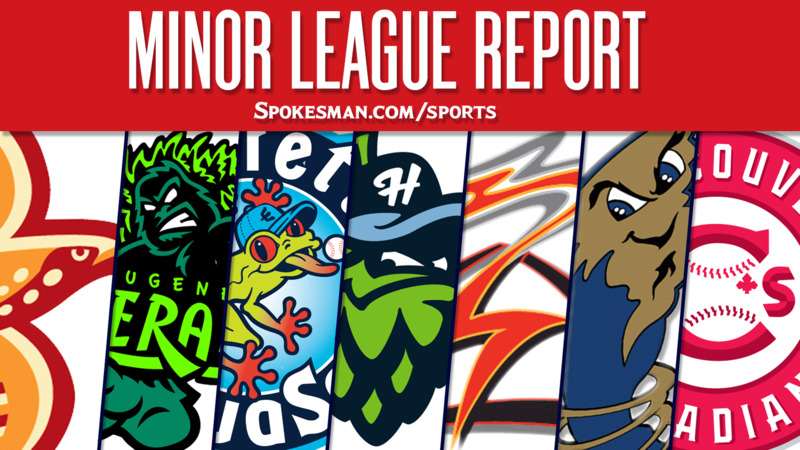 Everett 8, Tri-City 5: Josh Stowers went 3 for 4 with a pair of doubles and two RBIs and the AquaSox (7-3) beat the visiting Dust Devils (5-5). Ryne Ogren went 4 for 4 with a double and a triple. Hillsboro 12, Salem-Keizer 2: Joey Rose went 3 for 5 with three RBIs and the Hops (5-5) topped the visiting Volcanoes (7-3). Cole Stapler (1-0) struck out four over three shutout relief innings for the win. Round Rock 5, Nashville 2: Drew Robinson homered, Ryan Rua drove in a pair and the visiting Express (33-42) beat the Sounds (33-40). Richelson Pena (1-1) gave up two runs on four hits and two walks over five innings. Frisco 9, Corpus Christi 4: Preston Beck went 3 for 4 with a two-run homer and the visiting RoughRiders (27-49) defeated the Hooks (48-27). Pedro Payano (3-6) struck out six over five innings. Down East 11, Winston-Salem 1: Josh Altmann went 3 for 4 with a pair of home runs and three RBIs and the visiting Wood Ducks (36-38) slowed down the Dash (44-30). Sal Mendez (1-0) allowed one run on five hits and a walk over five innings. Hickory 12, August 9: Ryan Dorow went 2 for 4 with a two-run home run and the Crawdads (31-41) topped the visiting GreenJackets (39-33). Justin Jacobs and Clayton Middleton also homered for Hickory. Published: June 25, 2018, 5:55 a.m.